Odhiambo, Eucabeth. Auma’s Long Run. Minneapolis: Carolrhoda Books, 2017. Auma has dreams. She wants to leave her small Kenyan village – where people all around her are dying – and attend high school. Then maybe – someday – she can become a doctor. Auma also has determination. She works hard and she can run. If she earns high grades and wins a track scholarship, maybe her dreams can come true. 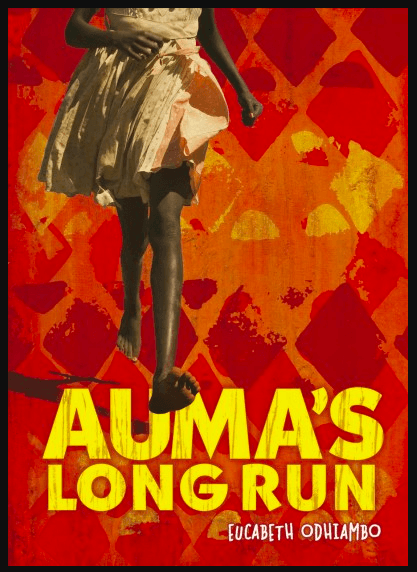 But then her father dies of AIDS and her mother becomes ill. Auma is needed at home to support her siblings. What should she do? This 297-page novel is not difficult to read. The font is relatively large, the lines of print widely spaced, and the margins generous. But the story is not a fairy tale and there is no simplistic happy ending. Recommended for mature readers 11 years old and up. Almond, David. Harry Miller’s Run. Somerville, Mass. : Candlewick, 2017, c2008. Eleven-year-old Liam wants to get outside and start training for the big race coming up. But his mother wants him to help an elderly neighbour move into a nursing home. 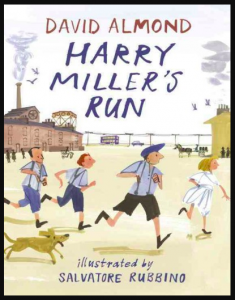 What starts out as a frustrating day turns into an amazing adventure as Liam listens to Harry tell about the great race he ran from Newcastle to South Shields when he was a young lad himself. This joyous novella – by a multiple award winning author – reads like a true story. I kept checking the flyleaf to find out more about the background. There was nothing. But this heart-warming story by a masterful writer will live in readers’ memories as if it really happened to someone we ourselves must have met somewhere. Whimsical illustrations by Salvatore Rubbino – creator of picture books about London and Paris – add to the charm of this unpaged book highly recommended for readers 9 years old and up. P.S. Always check out the books published by Candlewick. They’re reliably beautiful.